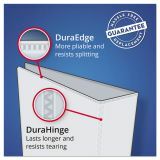 Slant rings hold up to 25% more sheets than standard round rings. Pages lie flat against back cover for easy index visibility. 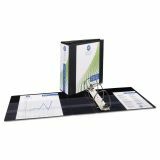 Create an "instant desk" by folding cover back for a smooth, flat writing surface. Two inside pockets store unbound materials so nothing gets lost. 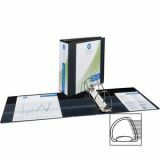 Avery Durable 3-Ring View Binder w/Nonlocking EZD Rings, 4" Capacity, Black - Durable view binder makes the perfect companion to keep all your important documents organized. Use the clear overlays on the front, spine and back to customize with your own inserts. Free templates are available online. EZD rings provide increased capacity compared to same-size round rings. Back-mounted metal rings let your letter-size pages lie flat. 4 ring capacity accommodates approximately 780 sheets. Organize and secure loose or unpunched paper with four interior pockets. Each pocket holds up to 20 sheets. 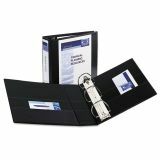 Durable construction is ideal for frequent reference. 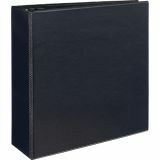 Binder also features a sturdy chipboard core and exposed rivets.